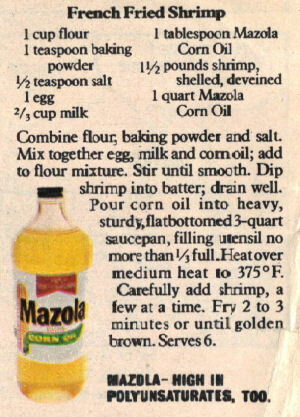 This promo recipe from Mazola Corn Oil was clipped from a magazine and found in a large collection, date unknown. I’ve typed it below along with a scanned copy. Combine flour, baking powder and salt. Mix together egg, milk and corn oil; add to flour mixture. Stir until smooth. Dip shrimp into batter; drain well. Pour corn oil into heavy, sturdy, flat bottomed 3-quart saucepan, filling utensil no more than 1/3 full. Heat over medium heat to 375°F. Carefully add shrimp, a few at a time. Fry 2 to 3 minutes or until golden brown.